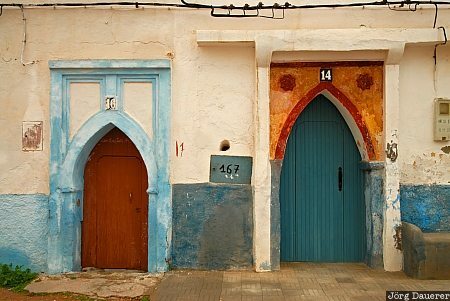 A brown and a blue door in a typical shape on a white facade in Sidi Ifni. Sidi Ifni is in Souss-Massa-Drâa on the Atlantic coast in the south of Morocco in northern Africa. This photo was taken in the morning of a sunny day in February of 2010. This photo is part of the exhibition Doors (June 2010). This photo was taken with a digital camera.